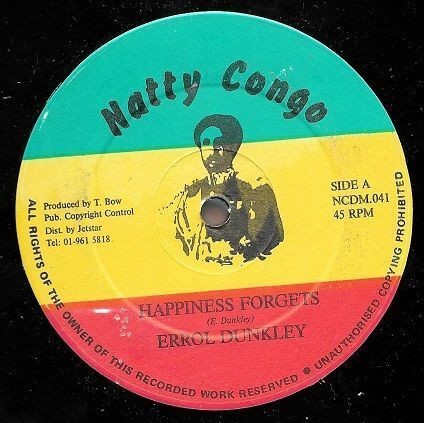 ORIGINAL PRESS: Errol Dunkley - Happiness Forgets / Part 2 (Natty Congo) 12"
Track Listing / Description PLEASE NOTE: These copies have been in storage for decades and show some signs of storage wear, including some very slight warping or dishing to the vinyl that should not affect play. This classic Errol Dunkley lovers rock from 1981. Produced by the late Trevor Bow of the London based roots reggae outfit The Sons Of Jah, Dunkley's vocal is sweeter than sweet and the swinging rhythm track, Bow's rhythms were usually cut in Jamaica with the islands top musicians, is a joy to listen to.